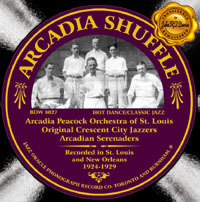 The complete recordings of the Arcadian Serenaders and the Original Crescent City Jazzers, and selected recordings by the Arcadia Peacock Orchestra of St. Louis. Includes extensive notes by James K. Williams and many recently-discovered photographs. Jack Ford (vln) dir. Bob Pope (t), Tommy Moore (tb), Bud Hassler (cl,as), Bill Schmidt (cl,as), Jules Schneider (cl,ts), Al Carsella (pac), Eddie Ward (p), Porter Brown (bjo), Chick Harvey (bb,v), Marty Gardner (d), Morty Livingston (v). Sophie Tucker (v) acc. by Bob Pope (t), Tommy Moore (tb), Bud Hassler (cl), Jules Schneider (ts), Ted Shapiro (p), Porter Brown (bjo), Chick Harvey (bb). Same personnel tracks 1-4; ? Al Carsella doubles on piano on matrices 8763-B and 8767-B. Sterling Bose (c), Avery Loposer (tb), Clif Holman (cl,as), Eddie Powers (ts), Johnny Riddick (p), “Slim” (Hall) Flohr (bjo), Felix Guarino (d). Joe “Wingy” Manone (c), Avery Loposer (tb,v), Clif Holman (cl,as), Johnny Riddick (p), “Slim” (Hall) Flohr (bjo), Felix Guarino (d), Chick Harvey (v). Sterling Bose (c), Avery Loposer (tb), Clif Holman (cl,as), Johnny Riddick (p), Bob Marvin (bjo), Felix Guarino (d), Morty Livingston (v). Note: Livingston’s first name is given as “Marty” on the labels of Okeh 40503 and 40517.